Since rediscovering the wonders of the public library, I’ve been checking out some foodie books that have been on my “to read” list for awhile. Usually, I just go out and buy the books I want to read, but being on a student budget and all, I figure that I should be more fiscally responsible and utilize the local library to see if indeed, I do want to part with my hard earned money on these books. Recently, I picked up two popular blog world reads. 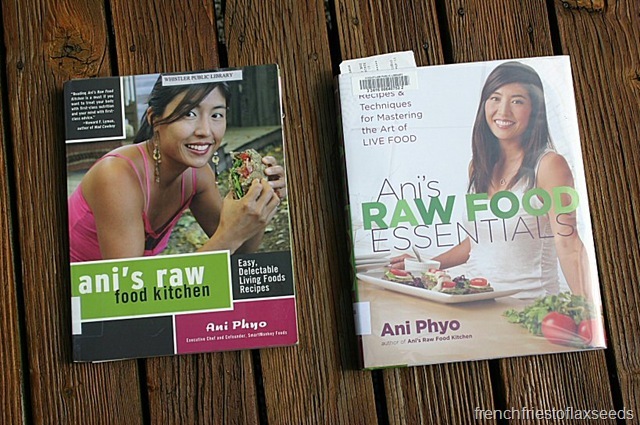 Ani’s Raw Food Kitchen and Ani’s Raw Food Essentials, both by Ani Phyo. The world of raw foods intrigues me from a culinary perspective. I know alot of people look at it as a way of life, and eating style they follow almost exclusively. That doesn’t really interest me – let’s be honest, I love my cooked foods. But I look at raw food as another culinary style, just as I would different ethnic foods, or different cooking styles. Good food is good food, regardless of the method use to prepare it. Although I haven’t really had the chance to make many of the recipes in the books as written, I’d still like to share my thoughts on each book, from a non-vegan, non-raw eating person. I actually ended up reading this book after the other one, even though it’s her first book. The reason being – my library didn’t have this book. I had to get them to bring it in for me from another library. So when I first started reading it, I felt like I was kind of reading some of the same things as in the first. Mostly when it came to describing kitchen equipment used and some techniques, tips, and basics. But once I got into the recipes, it then began to differ from the other book. The ingredients lists are mostly short, with easy to find items if you have a well stocked grocery store at your disposal. Instructions are also easy to follow and to the point. Lost of interesting flavour combinations that I wouldn’t have thought up myself. The green living tips throughout the book. Even though many of them are things we’ve all heard before, they are always a good reminder. The lack of colour photos – there was only one section in the middle. What can I say, I’m shallow 😉 But I think colour photos would really be a great way to showcase the vibrancy of all those raw fruits and veggies. We eat with our eyes. Some of the health claims/facts were…over simplified. I get that you want to promote your lifestyle as being a great way of life, and it no doubt is. But when you say that because you aren’t dealing with animal products, you don’t have to worry about cross contamination with bacteria like E. coli, I only need to point to all the raw spinach/tomato/carrot, etc recalls due to E. coli contamination to prove that’s not true. Everyone needs to be aware of food safety issues, regardless of what you choose to eat. Nutritional information was given for a few select recipes in the book. I found that the ones chosen were generally those made with less nuts/oils/calorically dense foods. It makes me wonder if that was done on purpose, so as not to scare the reader with the higher calorie counts on some of the other recipes. It just seemed a bit misleading to me. Any mention of the “life energy” in foods. It’s not my thing, so I tend to skip over/zone out through sections like that. The word “mylk”. I don’t know what it is, but it drives me nuts. Call it milk. No one is going to confuse brazil nut milk with its dairy counterpart. My favourite recipes generally came from the drinks, soups, salads, and desserts sections. I thought there were alot of interesting flavour combinations that I would like to try out, whether in a raw recipe from the book, or incorporated into cooked food dishes. I made one of the nut mylk recipes – Cinnamon Banana Buttermylk – and it was insanely creamy and delicious. Overall, I was please with this book from a recipe stand point, and I would probably purchase it to add to my collection. As mentioned before, I actually read this book first. I found it to be another easy read, filled with tips and recipes. It was similar in most aspects to the first book, but included sections on things like fermenting. I want to try out some of the recipes to make raw pickles and other fermented foods – it appeals to my food science mind, plus I think it would be fun. Too much emphasis on dehydrators in the recipes. For someone without a dehydrator, it means I end up skipping over alot of those recipes. This was especially true in the dessert section – so sad for someone who loves to make desserts like I do! More nutrition “facts” that I disagree with. One states that “sugar and dairy milk have no nutritional value”. That is flat out false. Everything has a nutritional value. You may deem it not worth eating, but if it has calories, protein, fats, carbs, vitamins, or minerals, then it has nutritional value. I like how many basic techniques are described in detail, like soaking and sprouting grains, fermentation, and substitutions. It gives the book more of a resource material feel, which is great to have in your kitchen. 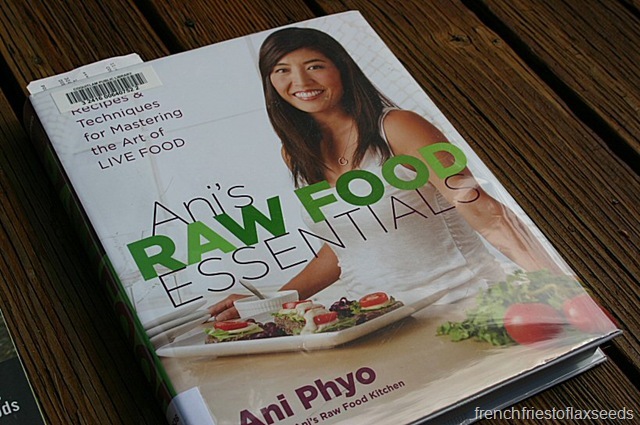 I also liked how it included a section on meal planning and good “to go” raw eats. I never got a chance to make any of the recipes in the book, but there were some sushi flavour combinations that I have store in the back of my mind to try out the next time I have a sushi craving. 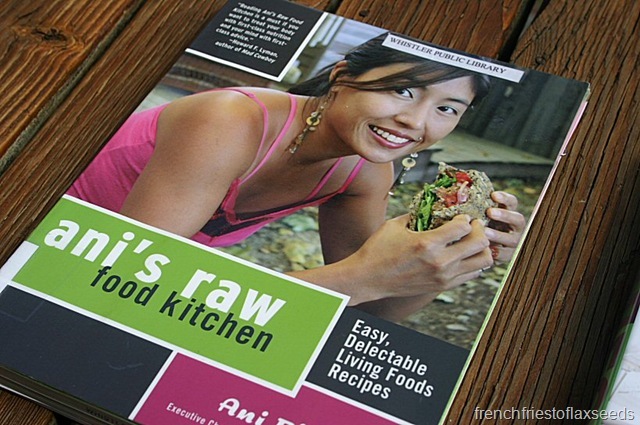 I would be less inclined to pick this one up before getting Ani’s Raw Food Kitchen if I was looking to get one raw uncookbook for my collection. But the whole fermenting and pickling section makes me want to consider getting a copy – especially if a soft cover version comes out (I prefer them for cookbooks to hard covers). Of course, this book is at my local library, so I guess I could just check it out again if I get the pickling mood. So there you have it – my take on some raw uncookbooks, for what its worth. Speaking of raw – check out my Raw Chocolate Hazelnut Pie. Some of your same dislikes were the same as mine. Her dishes are SO nut heavy, I often wondered about the nutritional content. And yeah, “mylk” just isn’t right. Great book reviews, Marianne. I tend to like lots of colour photos in a cookbook, too.